When the Sun reflects off the surface of the ocean at the same angle that a satellite sensor is viewing the surface, a phenomenon called sunglint occurs. 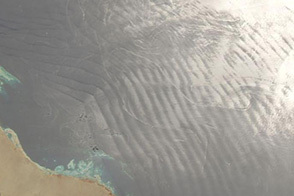 In the sunglint area of a satellite image, smooth ocean water becomes a silvery mirror, while rougher surface waters appear dark. Sometimes the sunglint region of satellite images reveals interesting ocean or atmospheric features that the sensor doesn't usually observe. 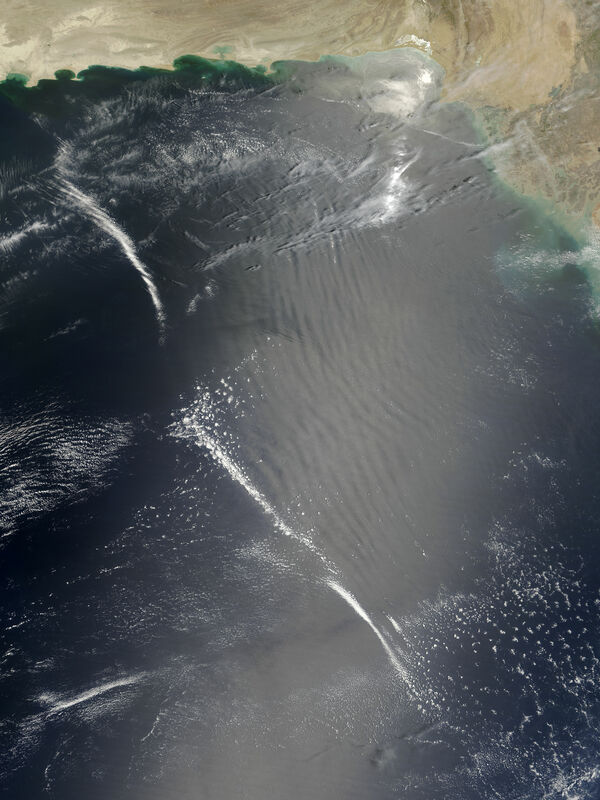 On May 23, 2005, the Moderate Resolution Imaging Spectroradiometer (MODIS) on NASA’s Terra satellite captured this image of a large-scale, overlapping wave pattern in the sunglint region of an image of the Arabian Sea. The wave pattern seen in the image is not from large ocean waves, however. 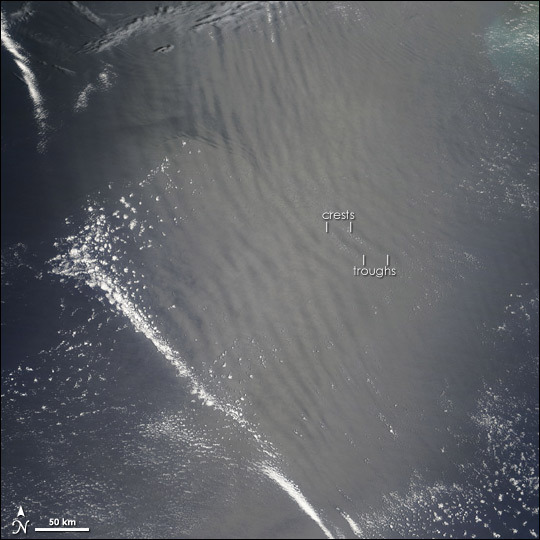 The pattern is the “impression” of atmospheric gravity waves on the surface of the ocean. As the name implies, atmospheric gravity waves form when buoyancy pushes air up, and gravity pulls it back down. On its descent into the low-point of the wave (the trough), the air touches the surface of the ocean, roughening the water. The long, vertical dark lines show where the troughs of gravity waves have roughened the surface. The brighter regions show the crests of the atmospheric waves. Beneath the crests, the water is calm and reflects light directly back toward MODIS. Clouds commonly form at the crests of the waves, and such clouds are visible throughout this scene. In addition to the wave pattern that the atmospheric gravity waves have created, several much smaller waves appear on the water’s surface as well. 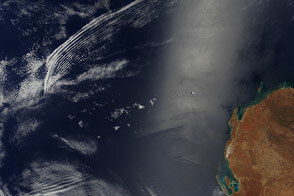 Although it is difficult to tell from this image, these small waves are probably ocean waves.